First off, I want to thank Fred H for suggesting this car to us, because I personally like them. 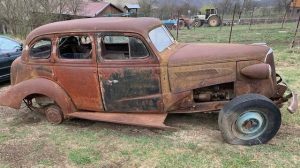 This one might be a four-door, but it appears to have potential as a great project or as a parts donor for a two-door shell. It’s for sale here on craigslist out of Minneapolis, Minnesota and it’s priced nicely at $4,500. As the Tri-Five Tribe knows, the 210 was squarely in the middle of Chevy’s sedan lineup for 1957. The 150 was the base model, and the Bel-Air was the bee’s knees. Almost every American, and many people around the world, instantly recognize the ’57 Chevy as the most iconic automotive symbol of American 1950s culture. Restore it, park it at a Drive-In, and put Elvis in the driver’s seat, and you’ve got the whole thing wrapped up. 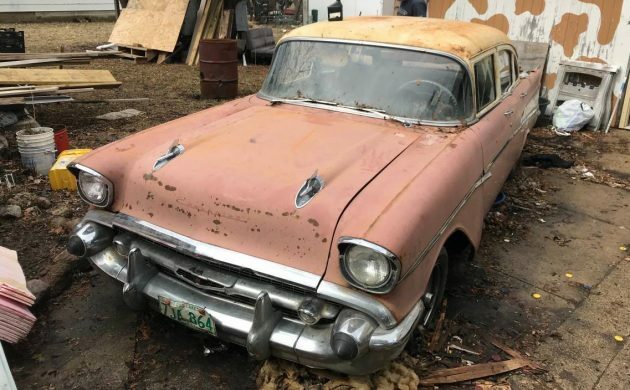 As we see and read in the seller’s advert, this particular slice of the American mid-century pie has the available 6-cylinder 235-ci engine with automatic transmission, 68,000 miles, and turns over but doesn’t run at this point. It appears to be all there and, while we’re not treated to an underhood picture, we can imagine its condition based on the rest of the car. 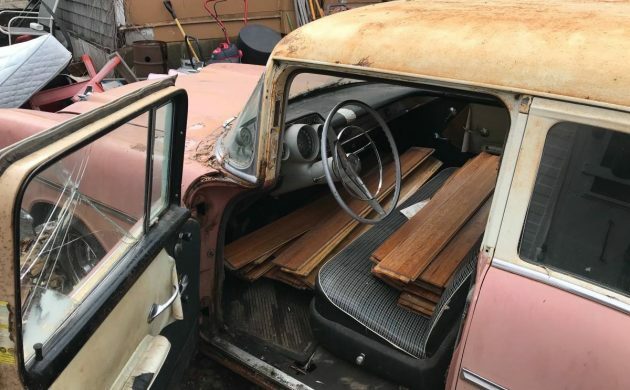 The seller says that the color is red (which would have been Matador Red) but I see nothing but pink, even in the door jambs. I do, however, see the three-piece front bumper and lack of “vee” on hood and trunk, the presence or lack of which indicated presence or lack of V8 engine. The trim looks decent, the interior appears to be all there, and the glass is mostly good. We’re told that all numbers match, so that is definitely a plus. Where I live, a rusty shell sells for about this price, so I’m really tempted to make a road trip. 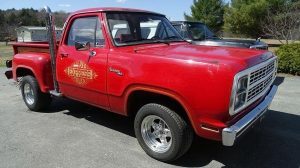 It would be quite a bit of work, and would never bring Bel-Air money after restoration, but for a guy like me who’s on a budget, it might not be so bad once it runs and drives. With each passing year, original cars like this are fewer and farther between. What would you do with it if you had the money? A 2 door with “Extra” doors! I have 1.5 pounds of unobtainium for sale. I too would like to do a four to two door conversation some day. I’m a welder fabricator and a mechanic. My hold back are medical reasons which have also led to financial reasons. This car has great potential, I hope someone gets it on the road. 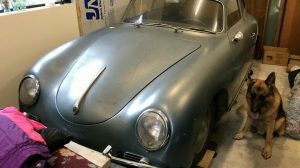 I agree that project cars worth saving are getting more scarce with each passing year. I’m greatful that I had a project car on the go before my health started to waine. I’m 80% done but have had some delays but I’m confident I’ll get there. As for the seats I’d just modify the seat frame to make it a fold forward design. I’d rather have a 4 door, cool car. A picture of the speedometer is not proof of mileage. 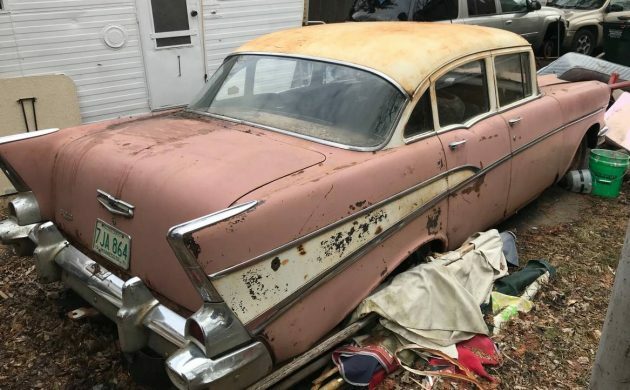 Someone would really want a 4 door 57 Chevy to tackle this project. 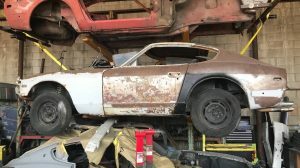 There are so many other obtainable cars that I’d be happy with, I don’t see the point in restoring this particular car. I have pictures of an identical looking car that belonged to a late aunt. The only difference was hers was a standard. The colour is definitely pink, for some reason I seem to have it in my head it was referred to as a salmon shade or something. I was only three when it was traded in on a 66 Valiant but there were a lot of pictures that showed it in its glory and I think even back then it would have stood out with it’s vibrant colour combo. That’s called “Canyon Coral” , Bill. Maybe they didn’t realize that to make it into a woody that it needs to be put on the outside of the car. ?? LOL!!! Yeah, I noticed the same thing. Problem is, it isn’t very forgiving, really stiff. 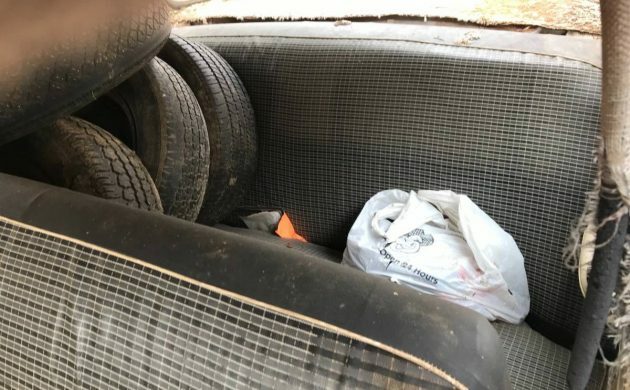 I wonder if the seller would take less if I didn’t want the spare tires on the rear seat and the pieces of wood flooring? Come on people make an effort. His or her problem is that I’ll bet you can find another 4 door hulk for less and maybe with a V8. If you want to sell a 6 cylinder stripper 4 door……..make me want it! Too two many doors. Those seat covers look like aftermaket jobs. It’s a three on the column, not a Powerglide. There would be a PNDLR in the speedometer if it was. That salmon pink was ugly when new and still is. What’s with the goofy rims? Hopefully it hasn’t been too kiddoed up. Fix everthing mechanical on it, put some stock rims and base hubcaps, not wheel covers on it. Clean everything as best as you can and make it a driveable dream. I’d say only worth about $1200.00, and I’d still want to make a 2 door out of it. And if I screwed it up I wouldn’t be out much money. I’d also weld in a camero/ Nova front 70’s clip to get the disc brakes. This would be a fun restomod project just my opinion. I love any tri-5’s. But, this one leaves a lot to be desired. I agree with the statement that the entire place looks like junk. I wouldn’t give more that $1,000.00 for it, as is. No engine bay pics, no underside pics, no trunk pics. Sorry…….